Only a few more days before Valentine’s Day. Have you got your Valentine’s Day card(s) done yet? I’ve got a simple one to share today. So I printed a second set of candy hearts, used my VersaMarker and go over where the black ink is and clear heat embossed it before inking candy hearts. They turned out a lot better. Here’s a close up. See what I mean? I hope you enjoy my card, and I hope you’d join in this month’s challenge – It’s a Love Thing (use pink and/or red on your projects). Scroll down to get the details. By the way the sentiment is “I love you” in French. Categories: Handmade Cards, Hero Arts | Tags: a2z Scrapbooking, digital kit, Heat Embossing, Love | Permalink. Hi! It’s Sue. In a few weeks, it’ll be roses and chocolates day – Valentine’s Day. With Valentine’s Day in mind, I created today’s card. 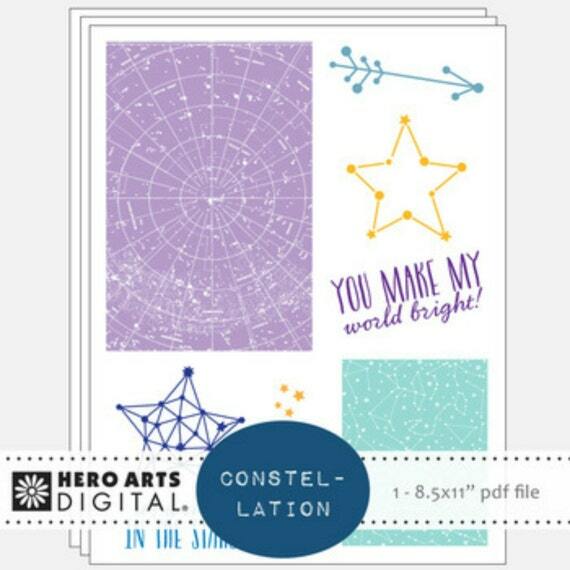 I started with Hero Arts Words of Love DK031 Digital Kit. I chose the “floral love black” image. I opened the image in MS Word, re-sized it and printed it on cardstock. I wasn’t sure which markers would make the inkjet printer ink bleed, so I decided to use Prismacolor colored pencils to add colors. I found a matching blue cardstock to mat the panel. For a bit of sparkle, I added some sequins. Categories: Clean and Simple, Digital, Friendship Cards, Handmade Cards, Hero Arts, Valentine | Tags: clean and simple, colored pencils, digital kit, Flowers, Love, Sue | Permalink. Hi there, it’s Angie here with a card for our December Challenge! I think I really have a thing for stencils and this is one of my favs ever! Hero Arts Bold Floral Stencil, used with Distress Oxide inks, Hero Arts Acetate for see through window, white embossing powder with Versamark ink, Gina K heavyweight card stock, and black fun foam. I made this background some time ago but didn’t do anything with it….then I decided to make a card similar to one I had made a few months ago for a DT post on a2zscrapbooking. (It was more CAS.) I usually prefer CAS designs, but I like the busy-ness of this stencil with the oxides and black contrast. Thanks so much for stopping by! Categories: Challenges, Handmade Cards, Hero Arts, Stencil | Tags: Acetate, Bold Floral Stencil, card, Distress Ink, Flowers, Hero Arts Love Stamp and Cut, Love, stencil | Permalink.